Gaku Tsutaja, Study with the Moon, 2019. Sumi ink, house paint, panel, media player, monitor, and speaker, 29 x 24 x 2 1/2 inches / 73.7 x 61.0 x 6.4 cm. Ulterior Gallery is excited to participate in the Material Art Fair with a group of works by the Japanese mixed-media artist Gaku Tsutaja. Tsutaja works with densely fabricated narratives that she conjures up out of historical events that have had a profound impact on society and culture. 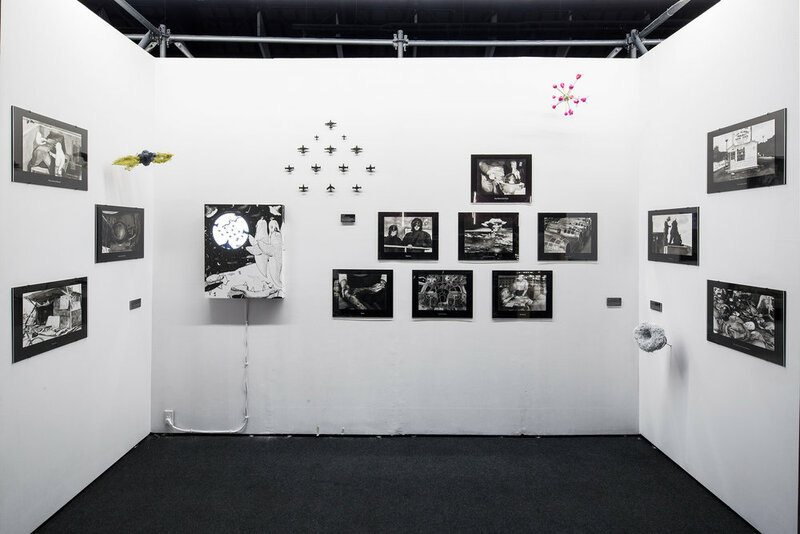 At the project booth at Material Art Fair in Mexico City, Tsutaja will create a composite work that addresses the post-World War II history of Enola Gay (here personified as female), the Boeing B-29 Superfortress bomber that dropped the atomic bomb “Little Boy” on the city of Hiroshima in 1945. Tsutaja’s solo presentation will be comprised of a video-animation painting, four sculptures, and a group of black and white drawings. The project booth will be treated as if it were a small presentation room at a history museum. The artworks will focus on different moments in Enola Gay’s career, all pivoting around August 6, 1945: the atomic bomb’s development in Los Alamos, New Mexico; as the bomber is loaded with the weapon on the island of Tinian in the South Pacific; in the air above Hiroshima on August 6, 1945; and consigned to outdoor storage at Andrews Air Force Base in Maryland, where she gradually became dilapidated after WWII. Tsutaja creates a narrative and a subjectivity for Enola Gay as a way to reimagine a historical calamity and question the manner in which mainstream history is preserved, packaged, and presented. The booth’s centerpiece will be a painting that contains a video. The painting is based on an image from a 15th-century edition of Bartholomeus Anglicus’ medieval encyclopedia De proprietatibus rerum in which learned men of the era discuss the world; in Tsutaja’s painting, two imaginary characters observe the conflict and events happening around Enola Gay as the animated video unfurls in the moon-shaped screen in the center of the canvas. The drawings to be shown are based on historical photographs that Tsutaja discovered during her research on Hiroshima and Enola Gay. The sculptures represent spirits of lost American bombers during WW II and endangered plant species from the three locations of New Mexico, Hiroshima, and Maryland. For Tsutaja, these sculptures embody a vital but fragile link between the past and the present. Gaku Tsutaja was born in Tokyo, Japan in 1974, and currently works in Queens, NY. In 1999, Tsutaja obtained a BFA with honors from Tokyo Zokei University of Art and Design, and moved to Fukuoka to participated in the Center for Contemporary Art Kitakyusyu as a research fellow. Tsutaja moved to New York in 2006 and attended SUNY Purchase College, Purchase, NY from 2016 to 2018, graduating with a MFA. Her work has been shown in numerous exhibitions internationally. Please click here for a preview.